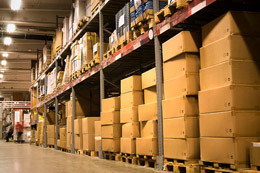 Datanational's PlantTalk:Inventory modules provides for a warehouse setup in the Plant/Aisle/Row/Tier format for warehouse put away (and all other inventory movement transactions). Inventory moves from one warehouse location to another will be date/time stamped and tagged to the operator who signed in to perform the inventory move. System-automated cycle counting and physical inventory functions will be supported with the system. Each manufacturing location can view their inventory at their facility level. Additionally, authorized users will be able to see other corporate sites' inventory information in real-time and also consolidated inventory numbers based on the scheduled information uploads at a corporate level. Throughout the manufacturing process, we can define the exit points for the system to collect various production and inventory status data in order to provide the ability to show real-time stock status levels on demand. This can be setup in a dashboard-style view that can be displayed on monitors throughout the facilities, or be called up on demand for the authorized system users.